Is Rupert Murdoch The Steve Jobs of Education Reform? Hecklers Say No. At the top end, our public schools are producing fewer and fewer graduates who have the skills necessary for the world’s best jobs. At the bottom, each year more than a million Americans—that’s 7,000 every school day—are dropping out of high school. In the middle, too many American children float from grade to grade in schools that never challenge them to reach their full potential. This is unjust, unsustainable and un-American. And it is especially galling because we have the technology to change it. He decries the New York Times’ coverage of education technology and the “colossal failure of imagination” in America’s school system. He notes that per pupil spending on K-12 education has doubled in the past three decades while achievement has been flat. He thinks technology can change education to meet individual needs of students the same way the iPod forced the music industry to cater to customers. He cites Rocketship charter schools in San Jose, Calif., and its blended model of brick and mortar classroom learning with tutor-led small groups that use online learning technologies. Let’s be clear: Technology is never going to replace teachers. What technology can do is give teachers closer, more human and more rewarding interactions with their students. 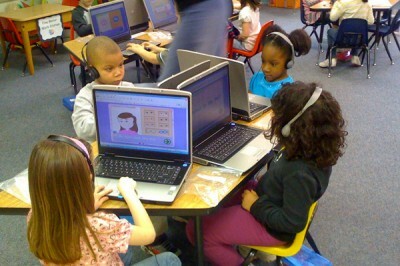 It can give children lesson plans tailored to their pace and needs. And it can give school districts a way to improve performance in the classroom while saving their taxpayers money. He makes the case that education should undergo similar standardization. He points to more than 40 states agreeing what students should know in subjects like math and English. We have to care. In this new century, good is not good enough. Put simply, we must approach education the way Steve Jobs approached every industry he touched. To be willing to blow up what doesn’t work or gets in the way. And to make our bet that if we can engage a child’s imagination, there’s no limit to what he or she can learn. On Thursday, a teacher’s union picketed outside the Palace Hotel where the summit was taking place. Murdoch is a controversial figure. During his speech, he often mentioned Apple co-founder Steve Jobs, considered by many to be a technology icon and visionary. “He was a Silicon Valley liberal who believed that monopolies like our public school system don’t work, and that parents deserved student vouchers for their children,” Murdoch said. Jobs was, in fact, in favor of student vouchers. Despite this, the protesters still heckled Murdoch, but the News Corporation CEO seemed to take things in stride. “It’s okay, a little controversy makes things a little more interesting,” Murdoch said to applause. 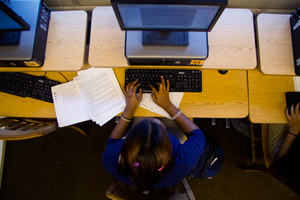 Must Liberal Arts Colleges Take a Conservative Approach to Ed Tech & Reform?